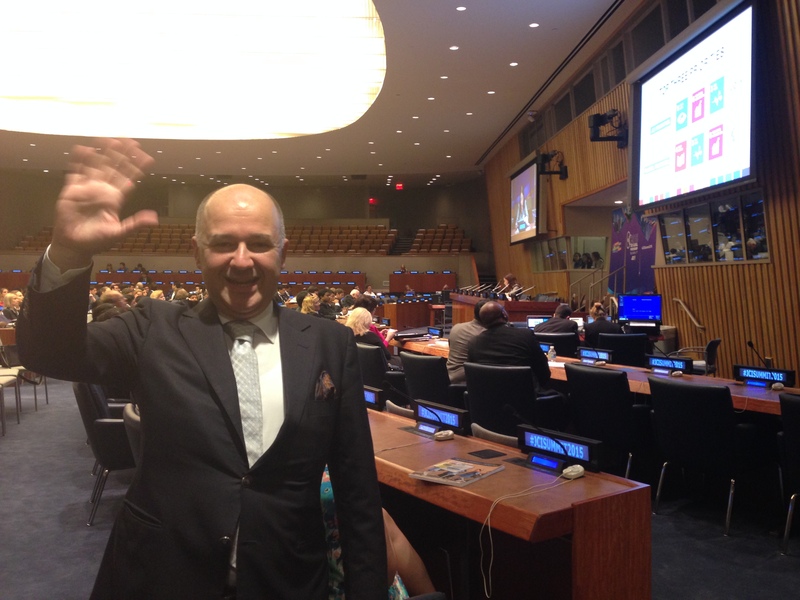 I was in New York 28–31 July to give a keynote speech on angel investment at the JCI Global Partnership Summit, held annually at the United Nations Headquarters. 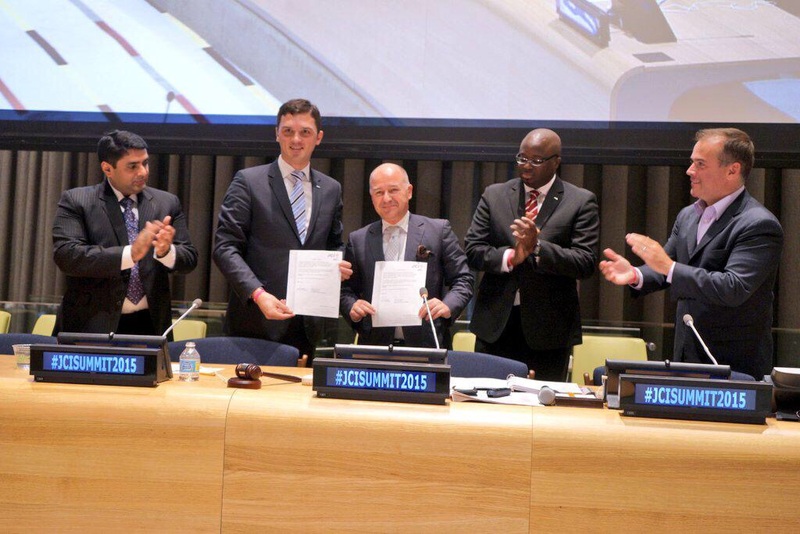 During the summit, JCI President Ismail Haznedar and Arrey Aberson, JCI Secretary General, announced that I was now recognized as the 7th JCI Ambassador with a decision of the JCI global board. It was a great honor for me to be recognized as a JCI Ambassador (among them are Ban Ki-Moon – the Secretary General of the United Nations) of such an very important global community, which has more than 200,000 members in 182 countries worldwide. In this summit, a very good piece of news for start-ups and entrepreneurs came from the JCI headquarters: an announcement about ‘The Global Youth Empowerment Fund ’ to be powered by the JCI Foundation. On the final day of the summit, following the announcement and launch of the ‘JCI Empowerment Fund to Support Start-ups & Entrepreneurs’, I was pleased to sign, as the Vice President of EBAN (the European Trade Association for Business Angels), the Letter of Intent on behalf EBAN. This letter is the first step towards connecting the JCI community with 275,000 business angels in Europe. EBAN was founded in Brussels by the European Union in 1999 to create a global voice for all business angel investors in Europe. What do business angel investors need? They need smart business ideas to invest in. Where do these smart business ideas come from? They stem from the young generation between 18 and 40 years old. So I am sure this first step between the JCI and EBAN communities will be remembered as a visionary step in the future, because I cannot imagine a better marriage than this in the global early stage investment market. Founded in 1944 and based in St. Louis, Missouri, USA, JCI is a non-profit international non-governmental organization with chapters in 182 countries and boasts more than 200,000 members worldwide. It has a consultative status with the Council of Europe and with the Economic and Social Council of the United Nations and UNESCO. The JCI philosophy and mission is to provide development opportunities that empower young people to create positive change. Through projects in more than 5,000 communities in more than 100 countries, members seek targeted solutions to local problems, creating a global impact. 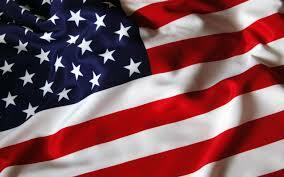 I will not tell you the features of the USA economy. I think you know enough about it. I will only highlight the biggest difference between the US and the EU economies – I think it is what creates the biggest competitive advantage for the States in the global entrepreneurship stage. The United States is the only advanced economy that does not guarantee its workers paid vacation time and is one of just a few countries in the world without paid family leave as a legal right, the others being Papua New Guinea, Suriname and Liberia. However, 74% of full-time American workers do get paid sick leave, according to the Bureau of Labor Statistics, although only 24% of part-time workers get the same benefits. While federal law currently does not require paid sick leave, it is a common benefit for government workers and full-time employees at corporations. In 2009, the United States had the third highest workforce productivity per person in the world, behind Luxembourg and Norway. It was fourth in productivity per hour, behind those two countries and the Netherlands. Do you think the EU can compete with the US in the entrepreneurship arena? Please answer this question by taking into consideration the information I’ve just given above. Another question is for EU citizens: Which party of which country of the EU can have a revolution and propose a system such as the US has (no paid vacation, no paid leave)? My answer: None of them. So, how will the EU compete with the US? My answer: It won’t, because it can’t. My answer: When the EU understands that the EU economy is very close to the communist philosophy, whereas the US economy is closer to capitalist ideology and takes an action after understanding this fact. A few months ago I was invited to a panel and dinner discussion at the US Embassy in Brussels to participate in a brainstorming session about the entrepreneurship ecosystems of the US and the EU. Here you can find the main outcomes of this important conference hosted by the US Ambassador to the EU and moderated by the Director of the Financial Times. EBAN was the main partner in this conference. New York’s gross state product in 2010 was $1.16 trillion, ranking third in size behind the larger states of California and Texas. If New York state were an independent nation, it would rank as the 15th largest economy in the world. However, in 2013, the multi-state, New York City-centered Metropolitan Statistical Area produced a gross metropolitan product (GMP) of nearly US$1.39 trillion, while in 2012, the corresponding Combined Statistical Area generated a GMP of over US$1.55 trillion, both ranking first nationally by a wide margin and behind the GDP of only twelve nations and eleven nations, respectively. Anchored by Wall Street in the Financial District, located in the Lower Manhattan district of New York City, New York has been called both the most economically powerful city and the leading financial center of the world. Lower Manhattan is the third-largest central business district in the United States and is home to the New York Stock Exchange on Wall Street, and the NASDAQ, at 165 Broadway, representing the world’s largest and second largest stock exchanges, respectively, when measured both by overall average daily trading volume and by total market capitalization of their listed companies in 2013. Investment banking fees on Wall Street totaled approximately $40 billion in 2012, while in 2013, senior New York City bank officers who manage risk and compliance functions earned as much as $324,000 annually. In the 2013-14 fiscal year, Wall Street’s securities industry generated 19% of New York State’s tax revenue. New York City remains the largest global center for trading in public equity and debt capital markets, driven in part by the size and financial development of the U.S. economy. New York also leads in hedge fund management, private equity, and the monetary volume of mergers and acquisitions. Several investment banks and investment managers headquartered in Manhattan are important participants in other global financial centers. New York is also the principal commercial banking center of the United States. Many of the world’s largest media conglomerates are also based in the city. 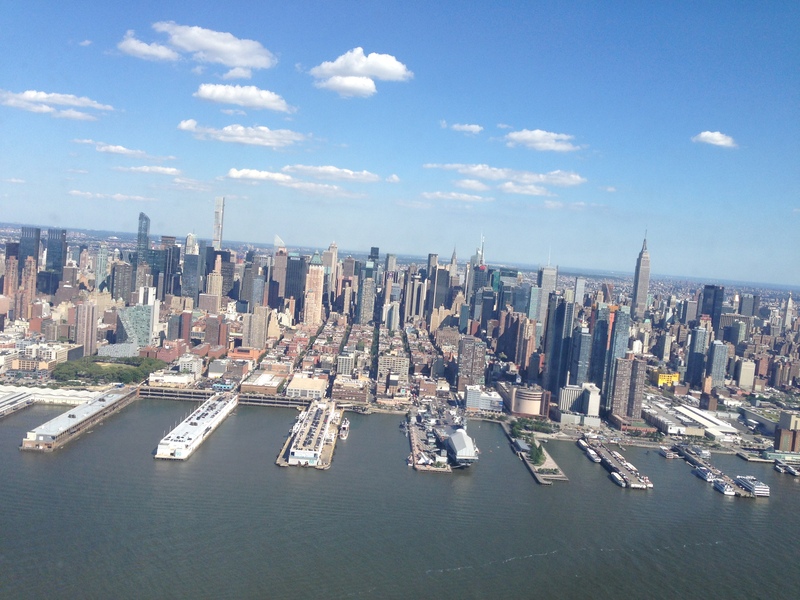 Manhattan has approximately 520 million square feet (48.1 million m2) of office space in 2013, making it the largest office market in the United States, while Midtown Manhattan is the largest central business district in the nation. Founded in 1944 and based in St. Louis, Missouri, USA, the Junior Chamber of Commerce International (JCI) is a non-profit international non-governmental organization with chapters in 182 countries and now has more than 200,000 members worldwide. Through projects in more than 5,000 communities in more than 100 countries, members seek targeted solutions to local problems, creating a global impact. It has consultative status with the Council of Europe, with the Economic and Social Council of the United Nations and UNESCO. It encourages young people to become responsible citizens and to participate in efforts towards social and economic development and international co-operation, good will and understanding. It publishes JCI World, a quarterly magazine in six languages. It holds an annual congress, the JCI World Congress, in November of each year as well as regional annual meetings. The world faces great challenges and opportunities. 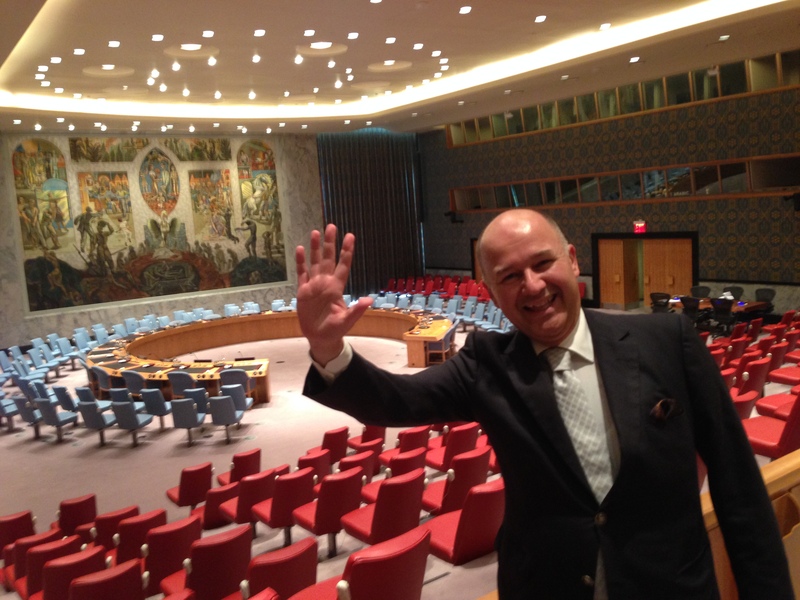 In response, international leaders will unite to adopt the next global development agenda this September 2015 at the United Nations Headquarters in New York City, USA. The year 2015 marks a year of milestones, with the deadline of the Millennium Development Goals, as well as the adoption of the Sustainable Development Goals. These upcoming pivotal moments allow the organization to visualize their involvement in providing sustainable solutions to these issues in development. As individuals hold increasingly stronger roles in the progress of communities, governments and businesses ignite opportunities for everyone to create shared value and create positive sustainable change. The 2015 JCI Global Partnership Summit will unite all sectors of society to discuss important issues facing the world and serve as a catalyst for all sectors to accept responsibility and act. Active young citizens are mobilizers in creating sustainable impact at the local level, and throughout this event, participants will identify action steps to create positive change, looking toward the future to 2030. The Global Youth Empowerment Fund is a new initiative to empower young people, ages 18 to 40, around the globe to impact their communities by investing in grassroots community projects. A partnership of JCI and the UN Millennium Campaign, the Fund will offer grants and training to youth-led projects that advance global development goals in local communities around the world using the framework of the Sustainable Development Goals. Mobilize young people to advance the Sustainable Development Goals through targeted grassroots projects, using the JCI Active Citizen Framework, that create awareness and ownership of community progress among all citizens. Engage all sectors of society (business, government and civil society) in global development goals through support of youth-led, community-based initiatives worldwide. Demonstrate the power of young people to create sustainable change on a global scale through advocacy, action and evaluation. The Fund will offer grants up to US $25,000 to support grassroots organizations or initiatives that are led by young people. Along with the financial investment, project leaders will also receive skills development training and project management support as well as mentoring and networking opportunities to ensure maximum impact of each dollar invested. The Fund will focus on strengthening the mechanisms for civic engagement in decision- and policy-making, implementation and accountability, focusing on ending extreme poverty, fighting inequality and injustice, and fixing climate change. The Sustainable Development Goals are a set of 17 global goals developed by world leaders and global citizens to end extreme poverty, fight inequality and injustice, and fix climate change. These goals, adopted in September 2015, will be the focus of changemakers from around the world for the next 15 years. To learn more about the goals, visit http://www.globalgoals.org. Partners of the Global Youth Empowerment Fund are joining a worldwide movement to advance ending extreme poverty, fighting inequality and injustice, and fixing climate change. by investing funds to support community-based projects. The Fund brings a strategic, holistic approach to these global challenges with strong emphasis on monitoring and evaluation with clear and measurable outcomes. The results of these projects will tell a story of global impact led by young people and supported by companies and organizations on the front lines of creating a sustainable future. Partners will align themselves with JCI’s global network of nearly 200,000 members in 120 countries who are already working to create positive change every day in 5,000 communities around the world. A partnership with the Global Youth Empowerment Fund is an investment in a healthier tomorrow. Imagine the spark as individuals and communities are ignited with the ability to create impact, and young people learn to work together and take action to change the course of our future. Through their support and shared vision, partners of the Fund will be at the forefront of the next era of global development. By joining this movement of global transformation, they will communicate to the world their sincere commitment to sustainable impact and demonstrate leadership in effecting visible change to address the needs of our communities. The Global Youth Empowerment Fund taps into an often-forgotten renewable resource: the passion and energy of young people. Through global collaboration of civil society, multinational corporations, small businesses and governments, all sectors of society can unite to provide opportunities and guidance for young people to harness their enthusiasm to initiate waves of global change that ensure human dignity for all. If you share this vision, we invite you to join the movement to empower the next generation of active citizens to create sustainable impact. To learn more, contact gyefund@jci.cc or Rachel Brown at +1-636-449-3100. Established in 2002 to support citizen participation in achieving the Millennium Development Goals, the UN Millennium Campaign works with like-minded organizations to inspire people from around the world to take action. 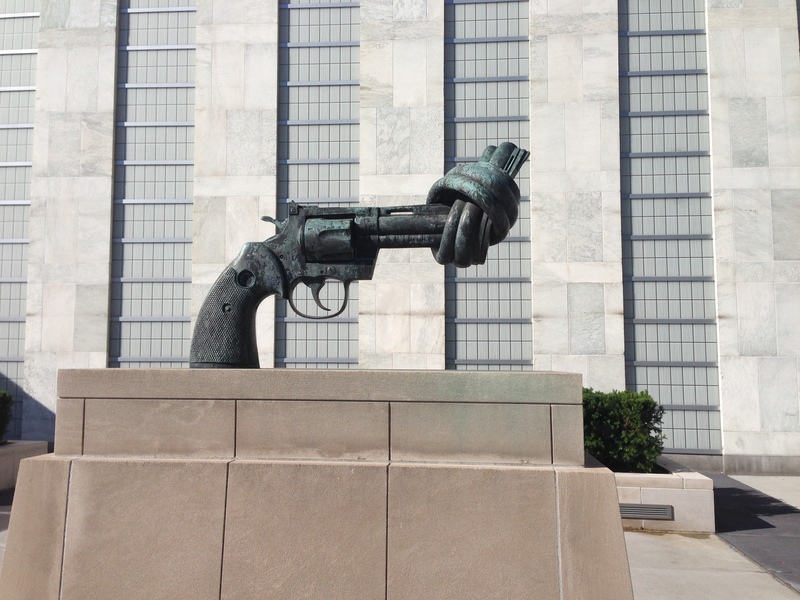 Additionally, the UN Millennium Campaign is engaged in the post-2015 process. I had to fly from Nairobi to New York via Istanbul. The best connection was Turkish Airlines but it consumed an entire day because the connecting flight was not until the next day. Turkish Airlines hosted all passengers at a five-star hotel in Istanbul for the night. I was so tired after a hard 4-day programme in Nairobi that I really don’t remember landing at the Istanbul airport or how I was transferred to the Marriott Hotel, how I slept that night, how I got up the next morning, how I was transferred to the airport or even how I managed to get to my seat for the flight to New York. When I remember all these details, I will come back here and write them. 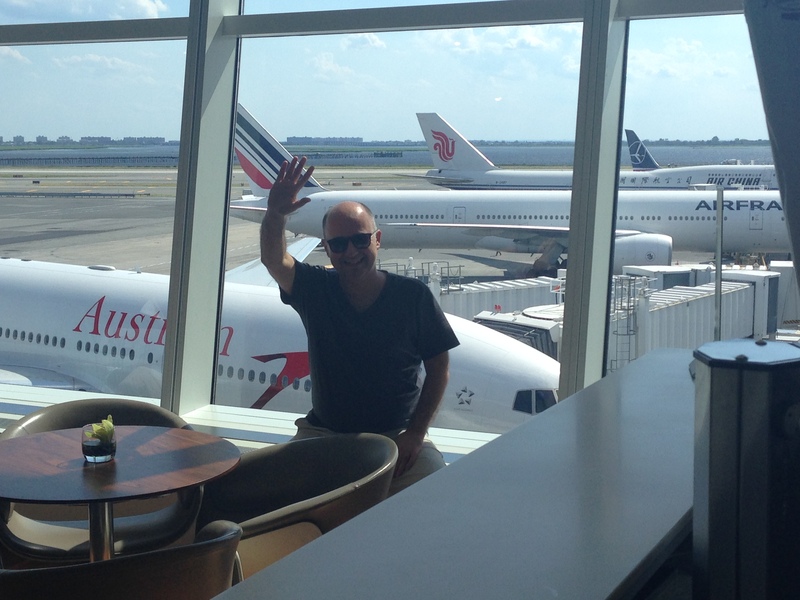 I arrived at New York’s JFK Airport around 4pm after a 10-hour flight from Istanbul. The taxi driver recognised the name of the hotel immediately. 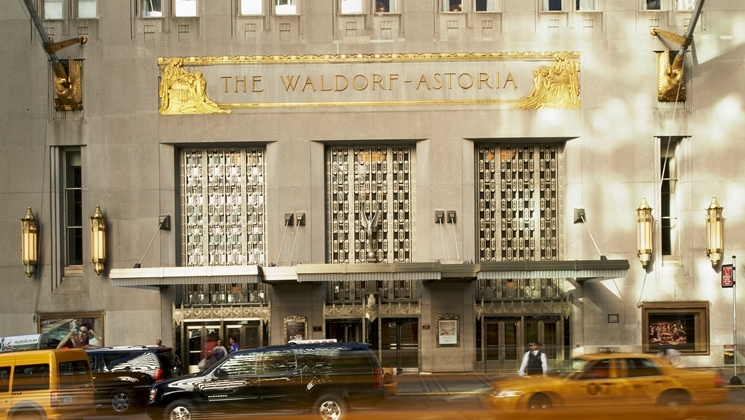 The Waldorf Astoria, the hotel where I would stay, is one of the best-known 5-star hotels of New York, located in the Manhattan district. It took 45 minutes to reach the hotel and it took another 45 minutes to complete my check-in at reception. I’d like to talk a little bit more about this hotel. It is the hotel where all sorts of notable guests have stayed, including Winston Churchill, Gerald Ford, the Pope, George Bush, Bill Clinton, Queens. 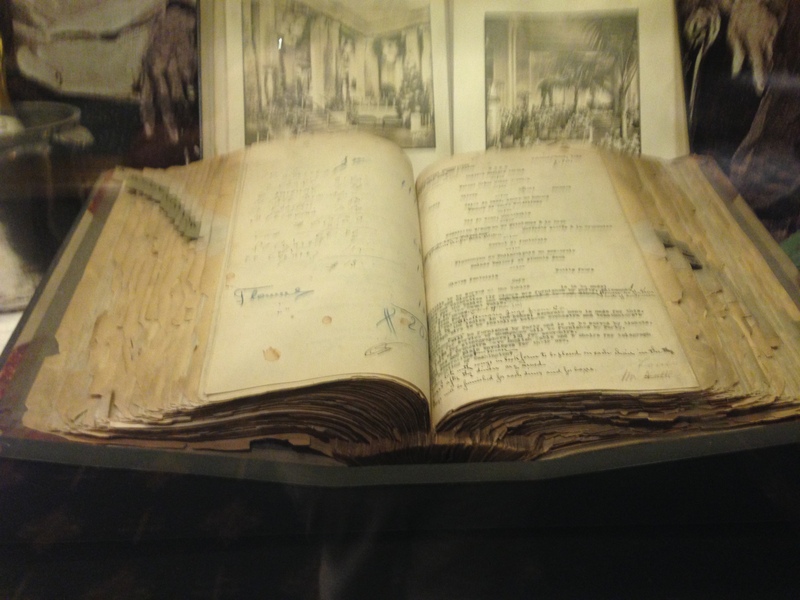 One really interesting thing about the hotel is that a menu book is on display, where you can see the menus of the 26th of February 1912, for example. I enjoy such ‘living history’ moments very much. I spent more than an hour reading the pages of this big notebook time and time again, trying to imagine people’s chats while creating the menu for that night. 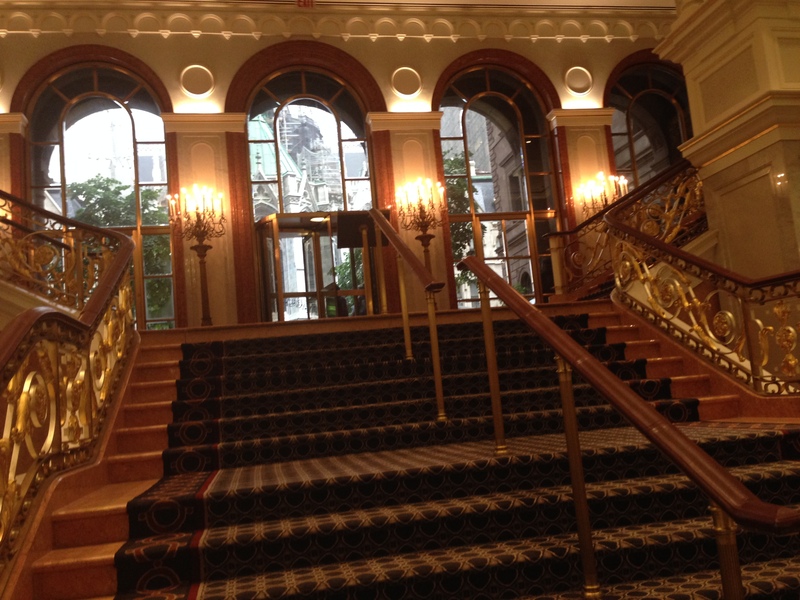 I think you should visit the website of this hotel to get a feel for the history of the place. 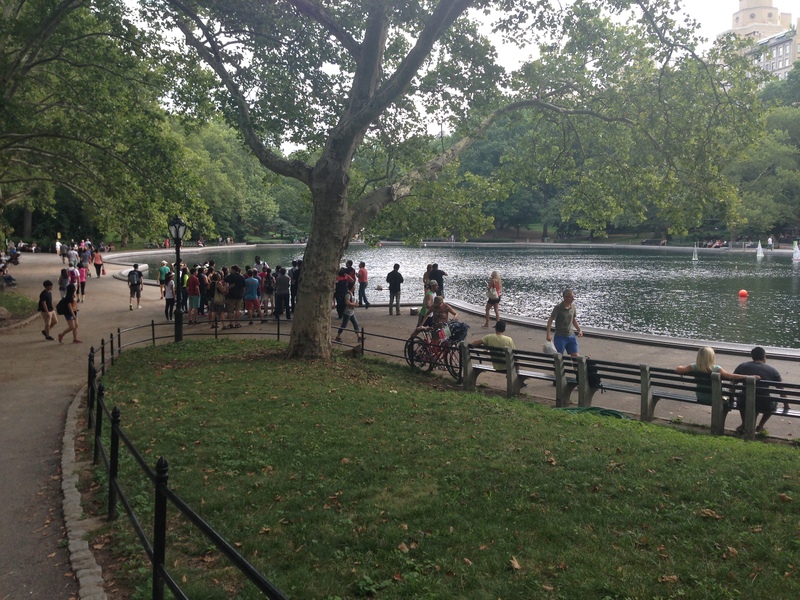 I strongly recommend it because it is in easy walking distance from Central Park, for one thing. An important tip: The New York municipality closes the roads on Saturdays and Sundays so that you can walk, bike, or run on the streets between 9am and 1pm. 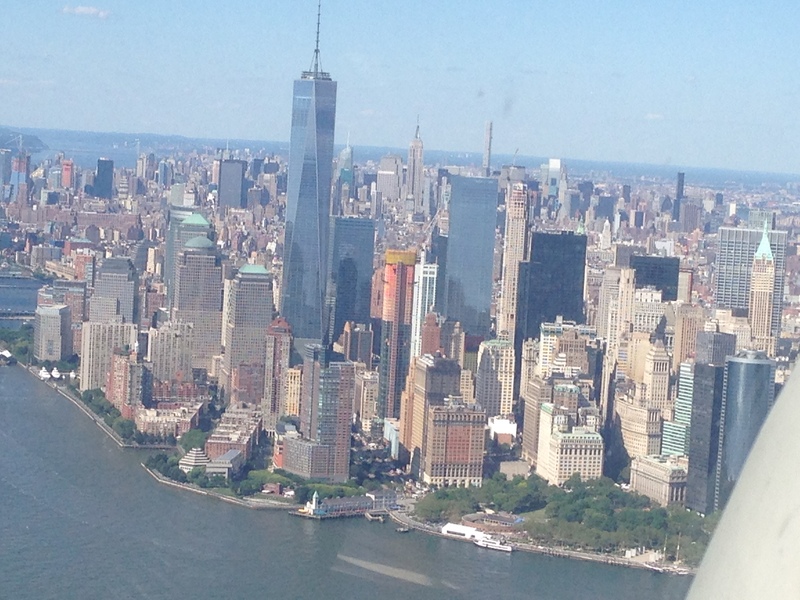 So if you are going to visit New York for touristic purposes, make sure to include a Saturday and/or a Sunday in your programme and enjoy these wonderful four hours by walking on the streets of Manhattan. If you like to bike, there are free bicycles for everybody at the corner of every street, sponsored by CitiBank — they are called CitiBikes. I was in my room – approximately 50 sqm and well designed – by 7pm. I just wanted to fall into bed. My speech wasn’t until the next day at 11am and I wanted to be in the conference hall before that time to check the sound system, so there was plenty of time for me to have a good night’s rest. But once I got into bed, disaster started. There was a regular sound of the air conditioning system coming from outside. Unfortunately, when I started listening to this sound it was impossible for me to sleep. I immediately put earplugs in my ears. The next morning the first I did was to go down the reception to ask for a room change. The receptionist showed me the new room and there I understood it was not the hotel air conditioning system. It was the city’s regular 24-hour sound and there was nothing to be done about this noise. So, if you are going to stay in the central business district of the city, please bear in mind that there is noise you have to listen to 24/7. However, from the second night on, my brain accepted this noise as a normal sound. I walked to the venue where the first day of the JCI Global Partnerships Summit would be held. It was just a 5-minute walk from my hotel. When I arrived at the venue at 10am, the programme had already started and there were approximately 200 participants in the room. After uploading my video, I started to listen to the panel discussions until I was invited to give my own speech. Because I had given a letter to the US President on angel investment just a few days before in Nairobi, I covered the global angel investment system in the world based on the content of the letter. I think it was a good 20 minutes of zipped content for Angel Investment 101. 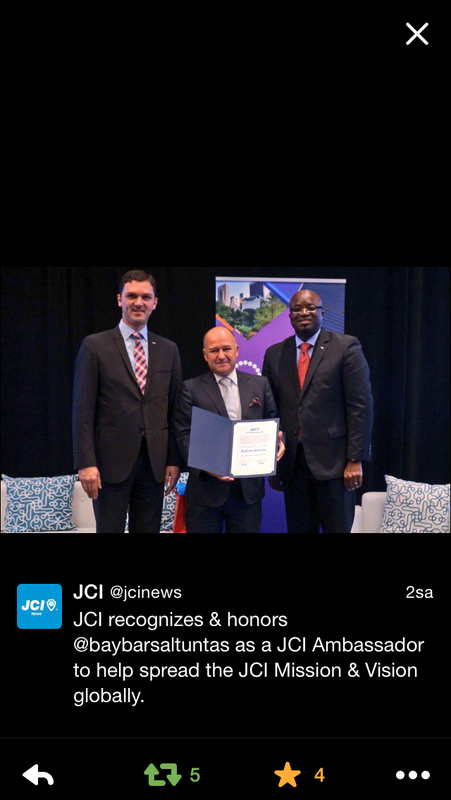 After my speech ended at exactly 12.30pm –before the lunch break – Ismail Haznedar, JCI President, and Arrey Oberson, Secretary General, announced that I was being recognized as a JCI Ambassador with the decision of the JCI global board. So I was asked to remain on the stage to receive the official declaration of this important title. After the speech of the JCI President, I made a short acceptance speech to the JCI community and was flattered that the JCI community gave me a standing ovation. This showed me this recognition for them too, not just for me. This made me feel even more responsible for the expectations of the JCI community. I want to thank the JCI President for nominating me, and the board members for electing me. I will do my best to promote the JCI philosophy all over the world. 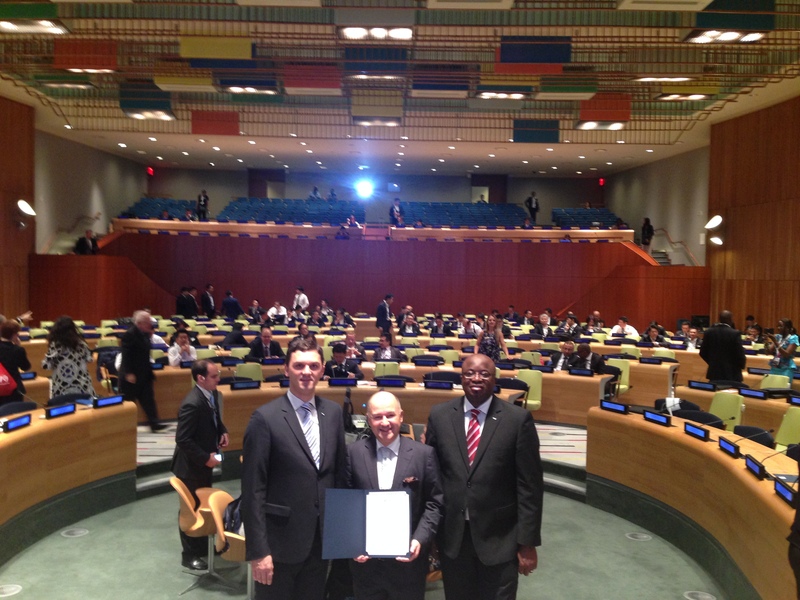 After my speech, 3 JCI members approached me — they were the only Turkish delegates coming from Istanbul. 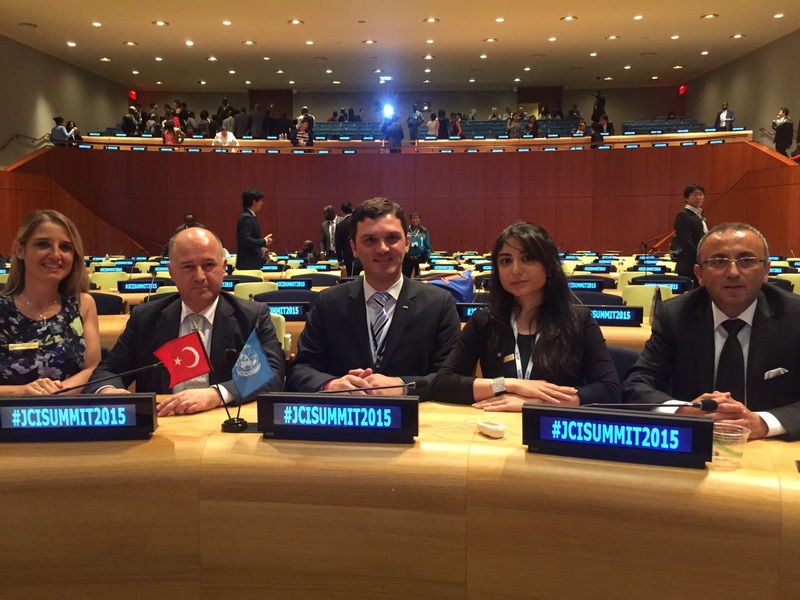 Ece is a lawyer at a bank in Turkey and is now acting as the executive assistant of the JCI President. Deniz, a life coach in Turkey, is one of the most experienced members of the JCI, with a 17-year history in the community. 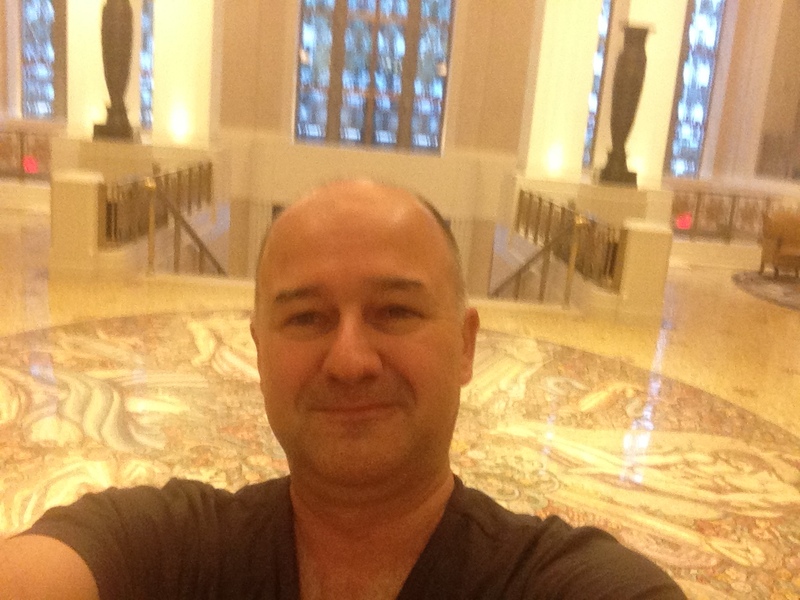 Ugur is a professor of strategy at Istanbul University. They have all dedicated themselves to contributing to the development of the JCI philosophy throughout the world and I enjoyed their friendship and hospitality during the summit. Another person who congratulated me was Fred Dubee, who had been recognized as a JCI ambassador before me. He is a very friendly person with a great sense of humor. A Senior Advisor at the United Nations, he is also a professor of strategy and contributes to the MBA programmes at Shanghai University in China. He is a Finnish-born Canadian living in both Canada and Finland. 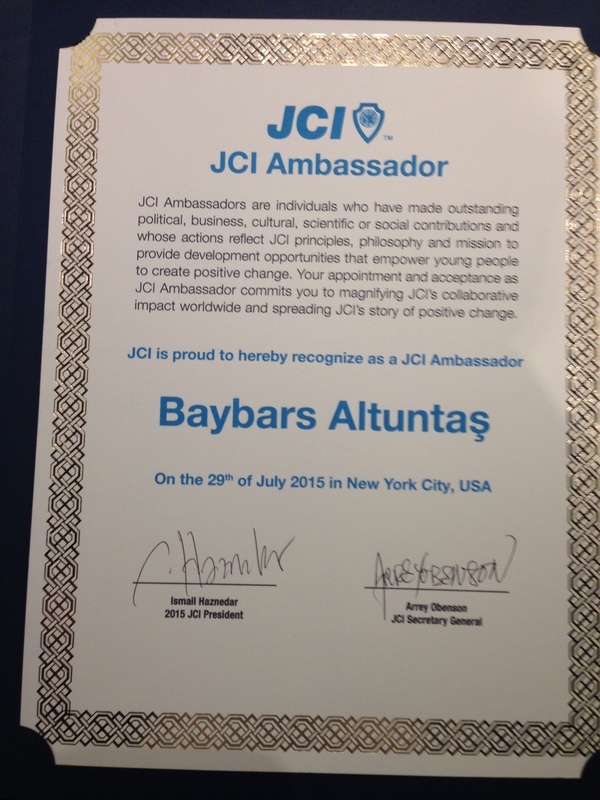 I greatly appreciated his friendly support as an experienced ambassador in the JCI community. At lunch time, Fred and I were interviewed by JCI News. I will post the video here in a few months when it is released on the JCI official website. After lunch, I returned to the hotel to change into my safari clothes for a walk around the district for a few hours. Ece, Deniz and Ugur were going to be at the hotel by 8pm because there was a party that night that we were going to attend together. Because of the ‘wonderful’ weather conditions of New York, we had to leave the open-air party at 10.30 and we went to Ugur’s well air-conditioned hotel for a chat. At 11.30pm, I jumped into bed and didn’t hear any sound until morning. 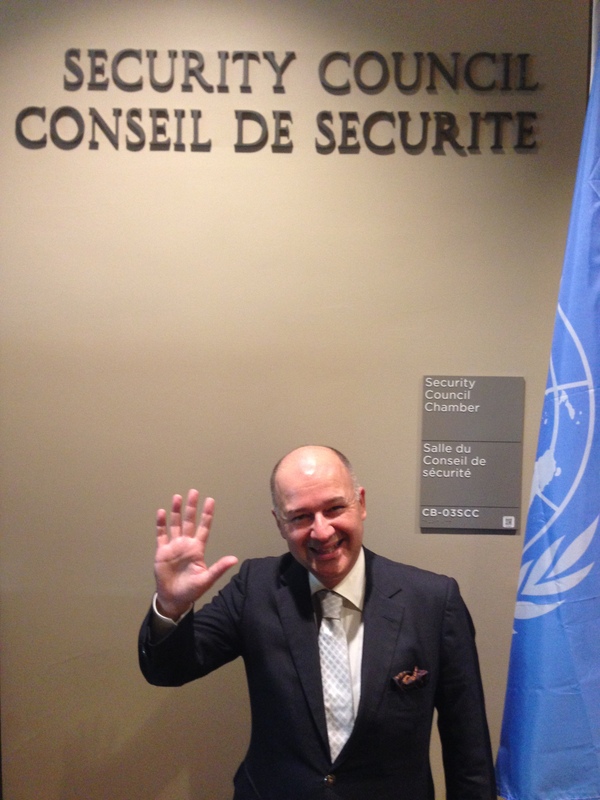 This day’s programme was to start at the United Nations Headquarters. Because the UN was very close to my hotel, it took me only 7 minutes to reach Conference Hall 4 of the UN Building at 9am. 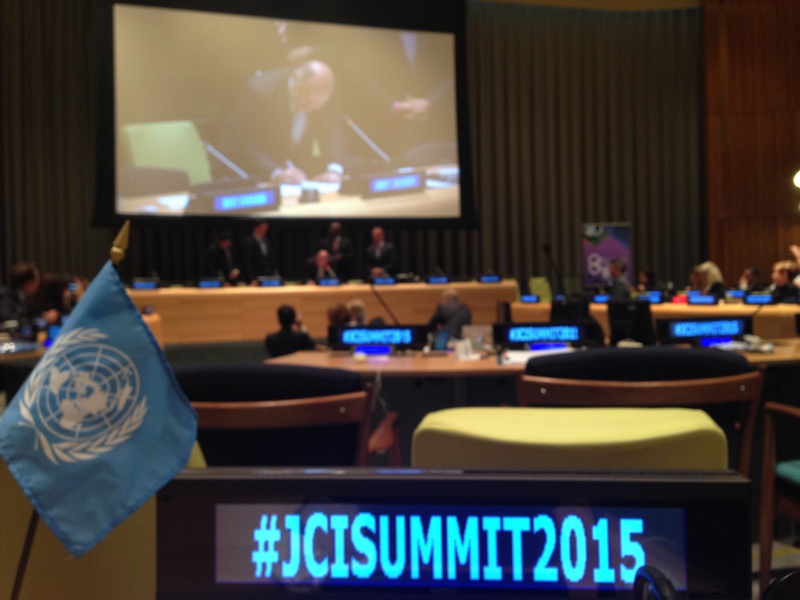 The morning’s program was filled with panels of the Global Partnership Summit. After lunch, I went back to the hotel, but not in 7 minutes this time. Because of a heavy rain, I couldn’t get back to the hotel until around 2pm because I waited at least 45 minutes for the rain to stop — but it didn’t stop! The rain went on and on and there was nothing scheduled to do in the afternoon, so my eyes advised me to sleep and rest until 7pm, and then get ready for the 8pm departure of the boat-cruise tour for the JCI community. While I was sleeping and dreaming, I heard a whatsapp alert from my mobile. It was a message from Ece, asking me where I was because the boat was about to leave. It was 8.20pm and I was still in bed wearing my pajamas! I told her it was not possible for me to reach the harbour because I was still in bed. She assured me it was quite possible because it wasn’t going to depart until 9pm, so I had 40 minutes to get there. I immediately got dressed and found a taxi to Pier 60. I was there 2 minutes past 9pm but they didn’t let me onto the boat. So I had to say goodbye to JCI community and got another taxi back to the hotel. After waiting 45 minutes on the street trying to hail a cab, a yellow cab with a Turkish driver took me back to the hotel. 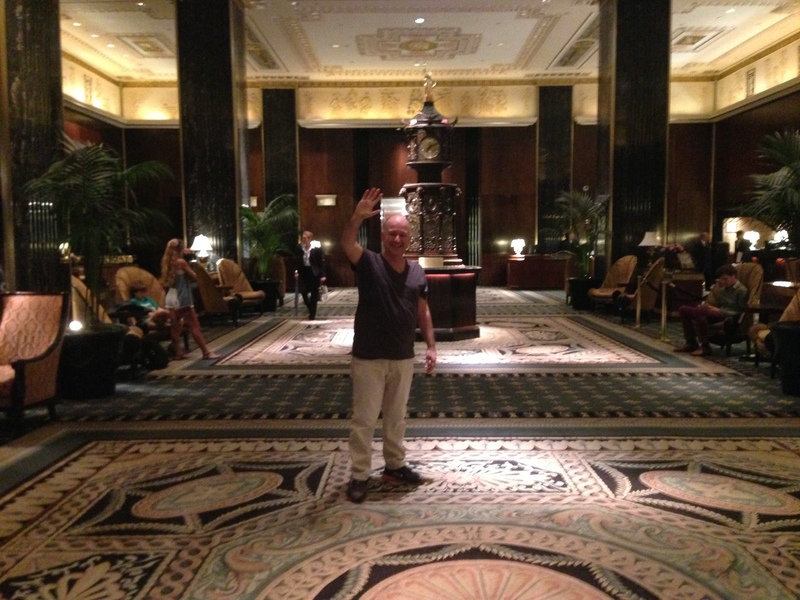 I chatted with him all the way the hotel. He had been living in New York for the last 20 years and he had previously owned a restaurant with his brother and sister. After his sister died, they decided to leave the restaurant business, and he now drives a taxi. 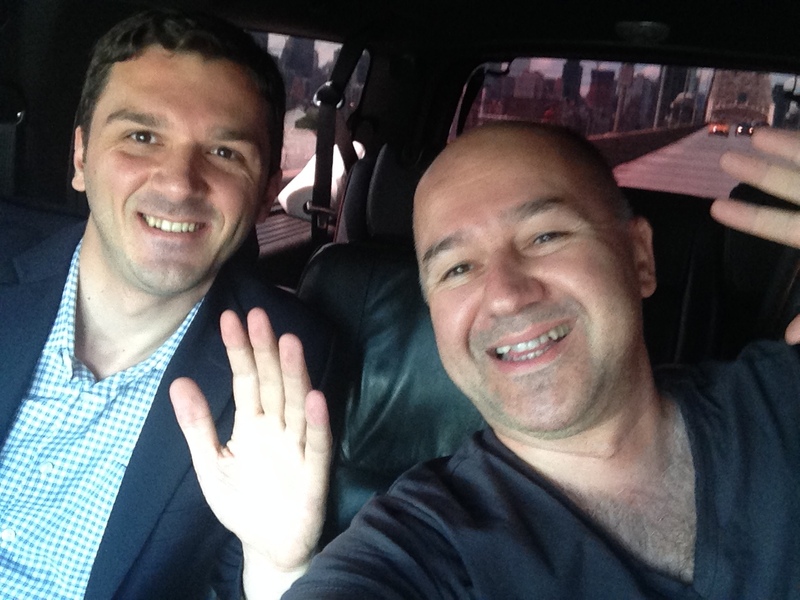 He told me that the mayor of New York City had made life more difficult for taxi drivers. He had allowed Uber to operate officially in New York and he established Green Taxis, which operate in case the yellow cabs go on strike. 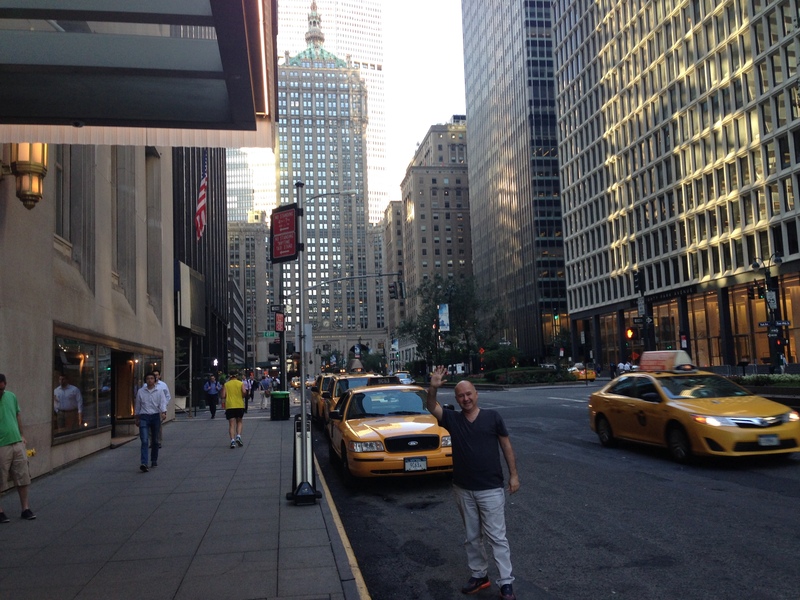 These two developments changed the life of yellow cabs in New York, he said. When he dropped me off at the hotel, I was barely able to convince him to take my money for the fare. Generally, Turks living abroad accept other Turks visiting the country as their natural guests, so that was the reason he didn’t want to charge me for the taxi fare. I was able to pay him only after some hard work on my part J in front of the hotel. 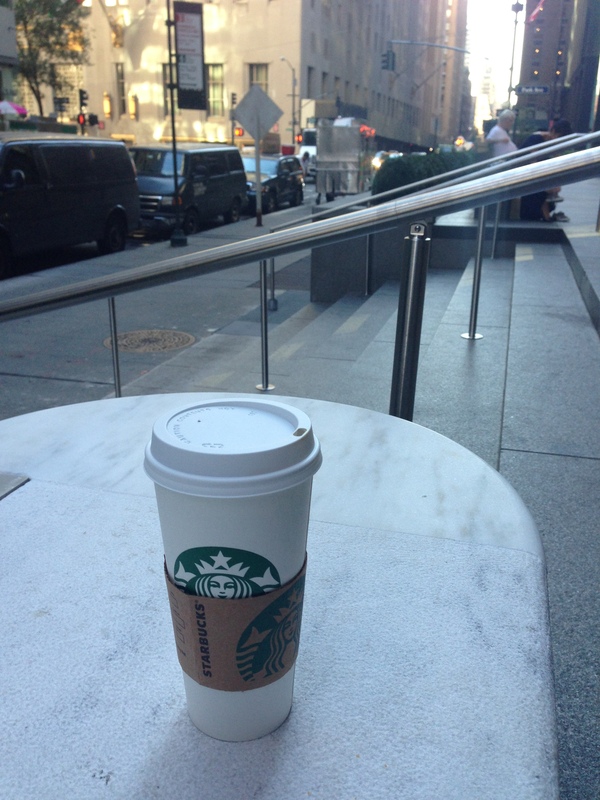 I got up at 7am and visited the Starbucks at the corner of the street. It was a nice morning to feel New York in more depth after the previous day’s heavy rain. After finishing my Kenyan coffee, I went to the UN Building, arriving there at 8.30am this time. Today’s Global Partnership Summit would take place in one of the main conference rooms of the United Nations, the room just next to where the UN Security Council meetings are held. 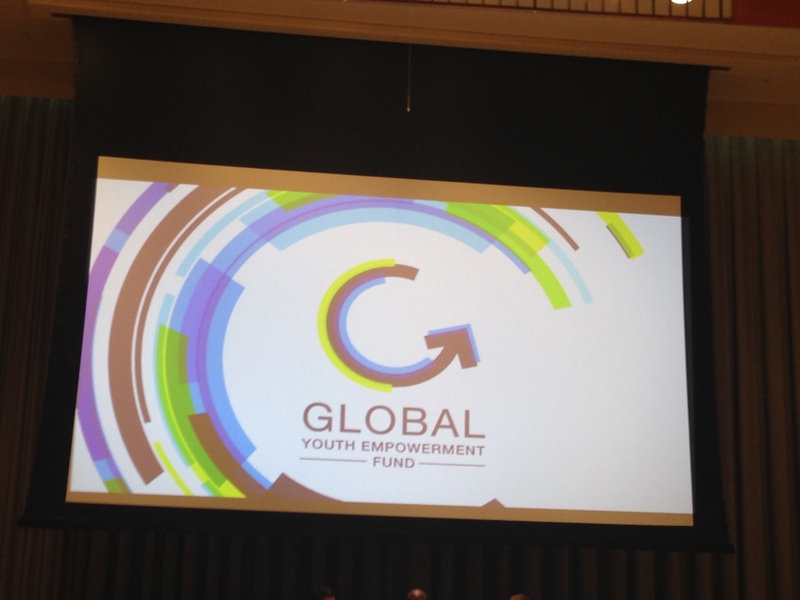 Today’s top event was the launch of the GlobalYouth Empowerment Fund. This fund is powered by the JCI Foundation and aims to finance start-ups and entrepreneurs. It will be supported by J-BAN, the business angel network that will increase the capacity of the fund by inviting new business angels from the JCI community. After the launch of this fund, the JCI President and I signed a Letter of Intent to get the support of the European Business Angels. As the Vice-president of EBAN, I was pleased to seize this great opportunity for our members to reach out to new smart start-ups from all over the world with the help of JCI. And it is important for JCI to get more investments from business angels with the help of EBAN. This Letter of Intent is the first step. The second step will be an MOU to be signed at the Annual Congress of the JCI, to be held in Japan in November. At this congress, I am planning to hold a workshop to develop a roadmap for running this fund efficiently, designed for the executives of this empowerment project. After the signing ceremony, Deniz and I got onto the bus that would take us to the Hard Rock café, where the closing ceremony and lunch were organized. It took an hour to get there by bus and the bus was full of JCI members. Traffic on Fridays is the worst of the week because most New Yorkers leave the city for their weekend escapes. It was a very nice good-bye party, sponsored by the South Africa Development Fund and presented by one the most celebrated anchorwomen of the US television networks. 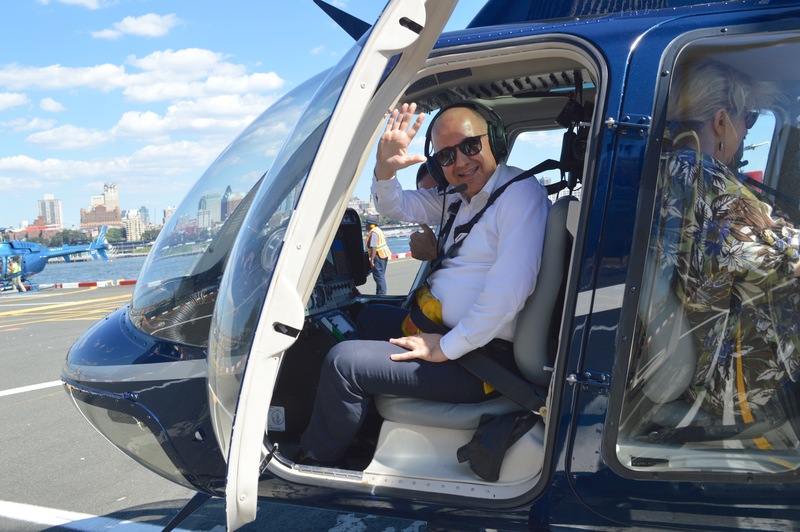 I had to leave the ceremony at 3pm because I had booked a helicopter tour for 4.00pm. Unfortunately, I spent 15 minutes finding a taxi and it took 30 minutes because of the traffic (in normal cases it is just 7 minutes) to reach the heliport. I got there just 15 minutes before departure. 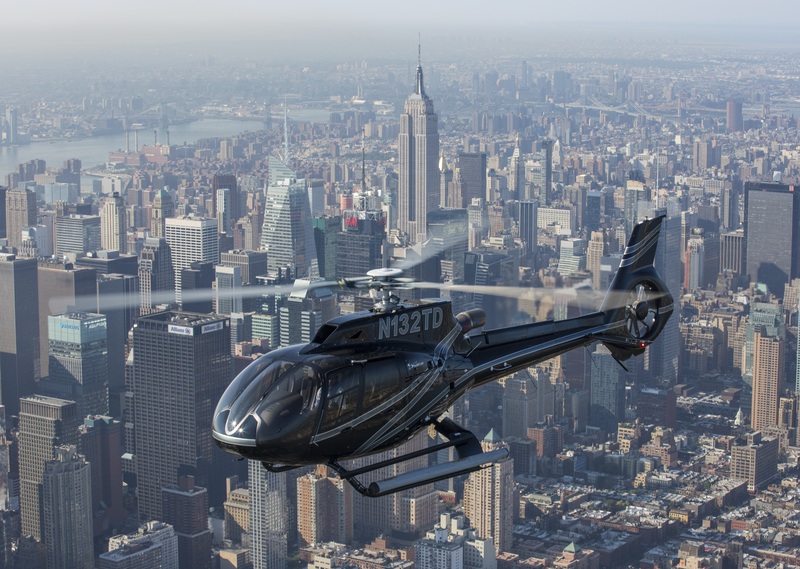 The helicopter tour is something you really should do if you visit New York. A 30-minute tour costs 304 USD but you can get a 20 USD discount if you do the booking online. I was seated next to the pilot and there were 2 couples in the other seats. Altogether we were 6, including the pilot. Did I enjoy it? Sort of. The San Francisco helicopter tour was much better. However, you are lucky if you can find a seat for the next day, so I strongly advise you NOT to do it on Friday and to book 48 hours in advance. Don’t forget to ask what happens if it rains. 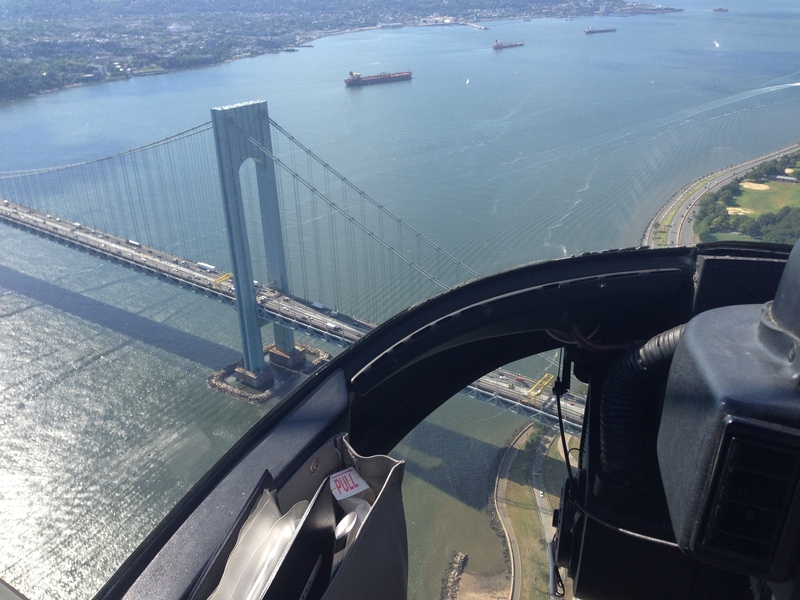 Also note that selfie-sticks are not allowed in the helicopter. We landed at 4.30pm and I immediately found a yellow cab and was at the reception of the Sweden JCI exactly at 5pm. It was an invitation-only reception where I networked with the Swedish JCI team. After spending an hour there, Ismail and I went to a very nice Brazilian meat restaurant, where we would have dinner with Mr. Kim Won-soo, the Under Secretary-General of the Untied Nations, Acting High Representative for Disarmament. It was a lovely dinner that lasted until 10pm. Ismail, Carlos, Arrey, Fred, Mr. Won-soo and I chatted mainly about the gaps between the new and old generations in particular regions of the world such as South Korea, North Korea, and Japan. In this dinner discussion, I presented a copy of my best-selling book to Mr. Won-soo, who had to leave us at 9.30pm to fly to Japan to make a speech at the Hiroshima ceremonies on behalf of Ban Ki-Moon, the Secretary General of the Untied Nations. 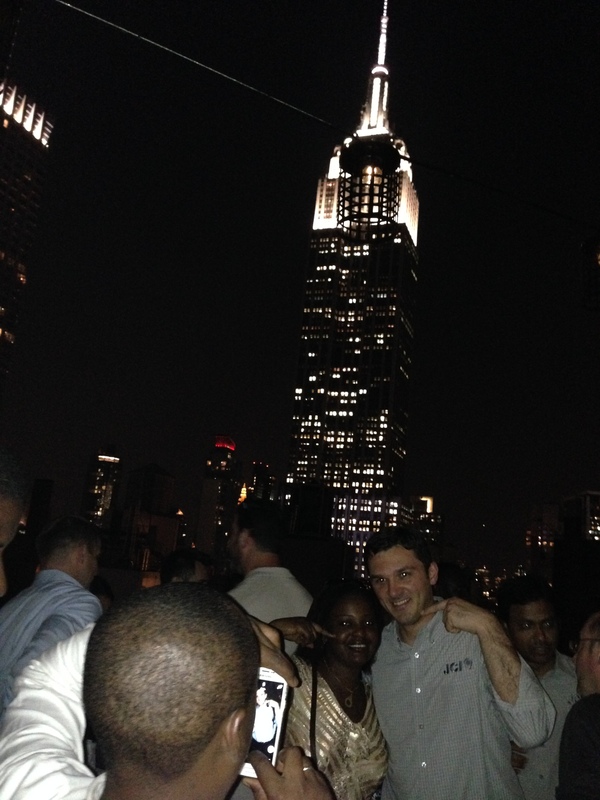 About the restaurant: It is a must-do for your New York list. Varioius types of excellently cooked meat are served at your table after an open-buffet salad bar. I don’t want to make more comments because they will not reflect all the taste. You have to experience it to understand it. After a long day that included a summit at the UN building, a closing ceremony at the Hard Rock Cafe, a helicopter tour, a reception of the JCI Sweden and a dinner discussion with Mr. Won-soo, now it was time for a good sleep. I was out of the hotel by 9am and to enjoy a wonderful Saturday morning. The New York municipality has an awesome rule: On Saturdays and Sundays, between 8am and 1pm, certain routes in Manhattan are closed to traffic to give everybody an opportunity to walk, bike, or run on the streets. There are free bicycles sponsored by CitiBank (CitiBikes) and you are given a route map to follow. There are also small stages set up in the streets, where you can enjoy street performances of singing groups or theater actors. I share here a performance of 4 women and one man just next to the Waldorf Astoria. I was back at the hotel by 1.30pm and Ismail arrived at the lobby just in time for us to go to the airport together. It was a lovely trip to the airport and we chatted about all the excellent programme of JCI in New York. BTW – I didn’t have to check out of the hotel; I found a letter in my room that said I didn’t need to do any check-out procedures at the reception desk because all the extras would be automatically charged to the credit card I had given when I checked in. Still, I wanted to check out from the reception desk as I do at every other hotel, but when I saw the line, I understood the value of the letter. I followed the advice in the letter. We were at the airport around 2.30pm. Ismail was flying to Sweden, so he had to get off at the 4th terminal and I got off at the 1st terminal. Because I was a bit early for boarding (my flight to Istanbul wasn’t until 6.50pm), the counter was not open yet, so I spent my time at Mc Donald’s. At 3pm, I was at the business class counter, where I had to deal with a problem. For the first time in the last 5 years, the check-in staff insisted on checking my hand baggage. It was just 20 kilos but I had 5 different pieces and she didn’t let me take them into the cabin. The reason I insisted on having it in the cabin was, I believe, a valid one: Turkish Airlines sells connecting flights very casually and because of the heavy traffic at the Istanbul airport, you may land on time but you may not be able to get off the plane in time. If your connection time is, say, 60 minutes, it is virtually impossible for your luggage to make the connecting flight. Because I had a connecting flight from Istanbul to Adana, from where I was going to continue to my summer house in Mersin, I didn’t want to check my bag so as not to take a risk of my bag not showing up at my destination. 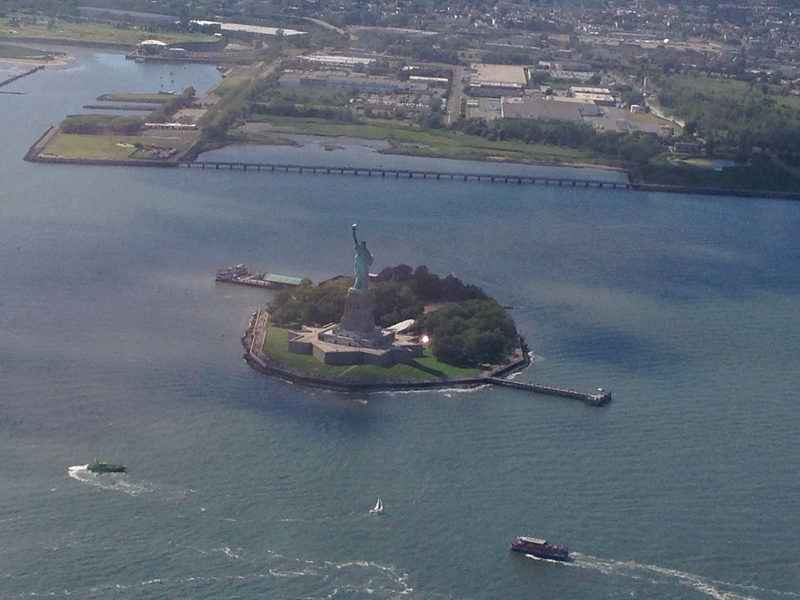 However, after visiting every supervisor at the airport in New York, I had to check it. 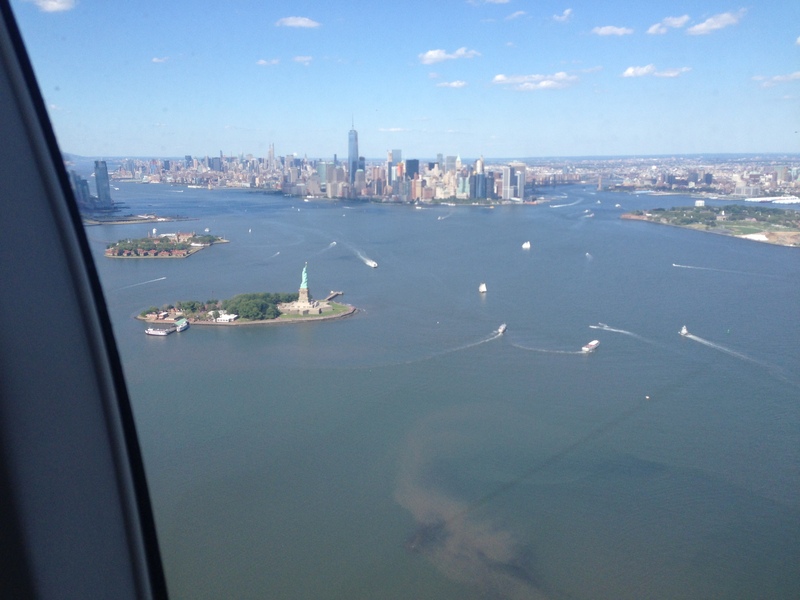 There was a 2-hour delay in our departure, so we left New York at 9pm instead of 6.50pm. Fortunately, the CIP lounge was perfect — not a big one like the Istanbul CIP, but the food and the service were very good. I spent 6 hours at the CIP lounge of Lufthansa, just sitting. I felt so exhausted after leaving Istanbul 10 days earlier for Nairobi and then flying to New York, so now it was time to dream about being at the beach near my house, where I would be in just 24 hours. In the flight, I sat next to Bedri, who was originally from the Turkish Republic of North Cyprus. He was a full professor at Utah University in the USA and he and his team were developing a new kind of antenna that could be used by everybody in their homes, on their mobiles, etc. He was going to Cyprus for his holiday and to check his olive groves, which he had inherited from his grandfather. By the way, he had a big foundation in Cyprus and a good friend of Mehmet Ali Talat, the former Northern Cyprus President. Because I had received the Best Turkish Businessman award from President Talat in 2010, we found many things to talk about. I enjoyed his companionship very much and gave him a copy of my book, which included my memories of the city of Famagusta at the beginning of my entrepreneurial journey. He was also going to meet with some business angels the following week in Ankara to get investment (around 1 million USD) for his new invention. Because he had studied in Turkey and then moved to the USA, it was not very easy to understand from his speech that he was from Cyprus. Generally the distinctive Turkish Cypriot accent lets any Turk understand that the speaker is from Cyprus. After landing at the Istanbul airport, Bedri went off to catch his Cyprus flight and I went to my Adana flight. 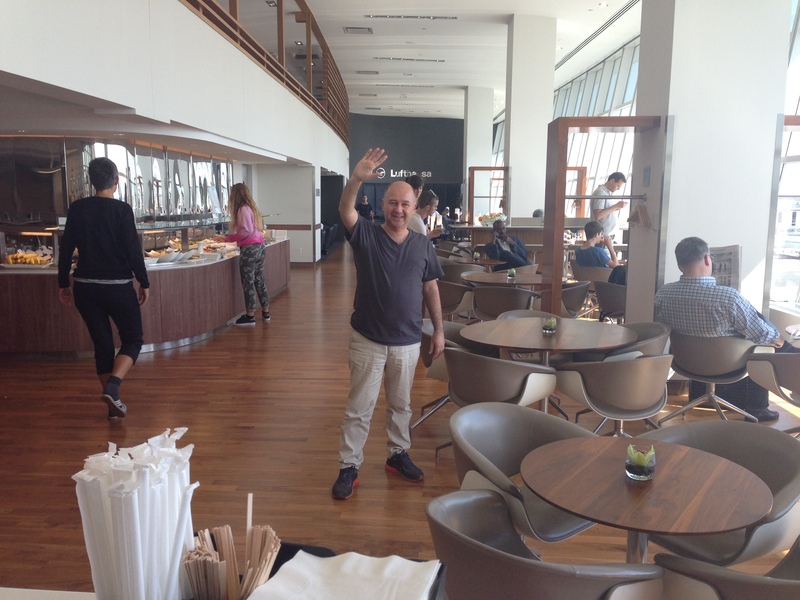 After a few hours’ waiting at the CIP lounge of the Istanbul airport, the flight to Adana departed on time. I was in Adana 75 minutes later and waiting for my luggage coming from New York. All the luggage arrived and everybody except me collected their bags. There was only one bag left on the carousel but it was not mine. I went to the lost and found department, where the clerk asked me the colour, type etc. I pointed to the bag on the carousel and told her that mine had a colour similar to the one on carousel, but it was a lighter blue. And mine didn’t have padlocks like the one on the carousel. The next event of the JCI will be in Kanazawa, Japan 3-8 November 2015 and I want to invite all of my followers to become a JCI member and attend this important JCI World Congress. The estimated number of delegates in the Japan Congress will be around 10,000. I think this number is enough to give you an idea about the size of the congress. You can learn more about it here. I’d like to thank to Ismail, Arrey, and Carlos for their excellent work in New York and I invite all of you to learn more about the JCI philosophy and to contribute to the vision of young people trying to make a positive change in this world. If you can fit the JCI World Congress into your schedule, please do so!